This data set contains estimated hourly CO2 atmospheric mole fractions and meteorological observations over North America for the year 2010 at a horizontal grid resolution of 27 km and vertical resolution from the surface to 50 hPa. The data are output from the Penn State WRF-Chem version of the Weather Research and Forecasting (WRF) model using lateral boundary conditions and surface fluxes from the CMS-Flux Inversion system. The CO2 atmospheric mole fractions have been used to simulate satellite XCO2. The meteorological observations are included to facilitate quantification of atmospheric transport uncertainty. There are 365 WRF output data files in NetCDF (.nc4) format provided with this data set. An IDL program, illustrating location of specific latitude and longitude locations on the native Lambert Conformal grid, and a static grid information file are included as companion files. Figure 1. Mean daily daytime average CO2 concentration [ppm] in the boundary layer in June 2010 from the WRF model. 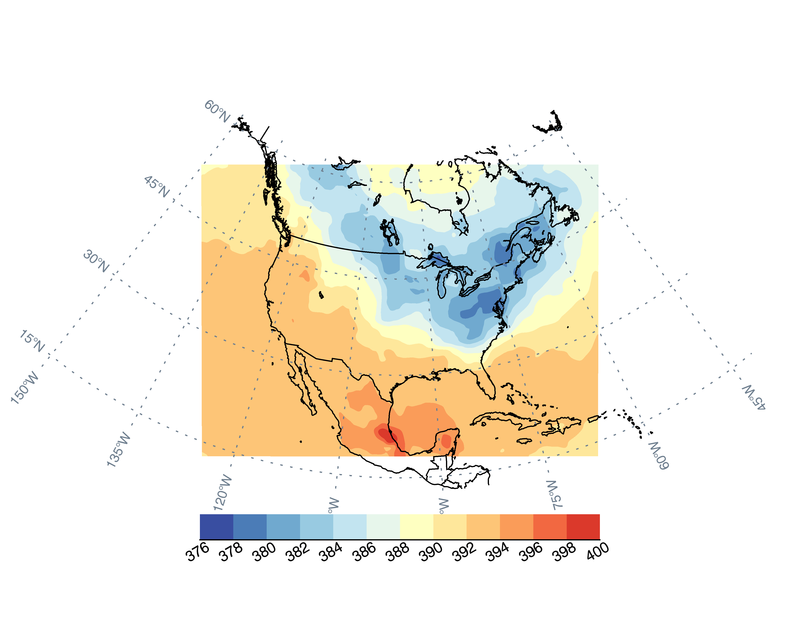 This data set contains estimated hourly CO2 atmospheric mole fractions and meteorological observations over North America for the year 2010 at a horizontal grid resolution of 27 km and vertical resolution from the surface to 50 hPa. The data are output from the Penn State WRF-Chem version of the Weather Research and Forecasting (WRF) model [Lauvaux et al. 2012] using lateral boundary conditions and surface fluxes from the CMS-Flux Inversion system [Liu et al., 2014]. These mole fractions have been used to simulate satellite XCO2. The meteorological observations are included to facilitate quantification of atmospheric transport uncertainty. An IDL program, illustrating location of specific latitude and longitude locations on the native Lambert Conformal grid, and a static grid information file are included as companion files. Funding for this project came from the NASA Carbon Monitoring System, NNX13AP34G, Quantification of the sensitivity of NASA CMS-Flux inversions to uncertainty in atmospheric transport. There are 365 WRF output files in NetCDF (.nc4) format with this data set. There is one file for each day of the year in 2010. The files provide hourly data for total CO2, geopotential, surface pressure, U and V components of wind, and temperature. One IDL program (.pro) and one static grid file in NetCDF format (.nc) are included as companion files with this data set. locater.pro: This IDL code provides the means for locating a specific latitude and longitude grid cell on a Lambert Conformal grid. This code requires both the static gridinfo file and a WRF output file to be in the same directory as this code. Additional documentation for file usage can be found in the comments in this code. wrf_static_gridinfo.nc: This static grid file contains the surface elevation height above sea level (variable HGT) of each grid cell and the longitude and latitude vectors for the mass grid (for CO2) and the wind grids. The meteorological observations were included to facilitate quantification of the atmospheric transport uncertainty in CMS Flux. Mole fractions in these files can be used to simulate satellite XCO2 using native pressure level information provided or an averaging kernel of choice. Uncertainty analysis will be provided in another CMS data product. The WRF model is designed to be used for weather forecasting and atmospheric research. The output archive files provided with this data set contain a subsample of variables from a WRF run using lateral boundary conditions from a CMS Flux Inversion for CO2 study. Meteorological observations were included to quantify the atmospheric transport uncertainty in CMS Flux. The IDL code provides a means of locating a specific latitude and longitude grid cell on a Lambert Conformal grid. This code requires both the static grid info file and a WRF output file to be in the same directory as this code. Lauvaux, T., et al. (2012), Constraining the CO2 budget of the corn belt: exploring uncertainties from the assumptions in a mesoscale inverse system, Atmospheric Chemistry and Physics, 12, 337-354, doi: 10.5194/acp-12-337-2012. Liu, J., et al. (2014), Carbon monitoring system flux estimation and attribution: impact of ACOS-GOSAT XCO2 sampling on the inference of terrestrial biospheric sources and sinks, Tellus B, 66, 22486, doi: 10.3402/tellusb.v66.22486.